What is the Natural soap with donkey milk made out of? 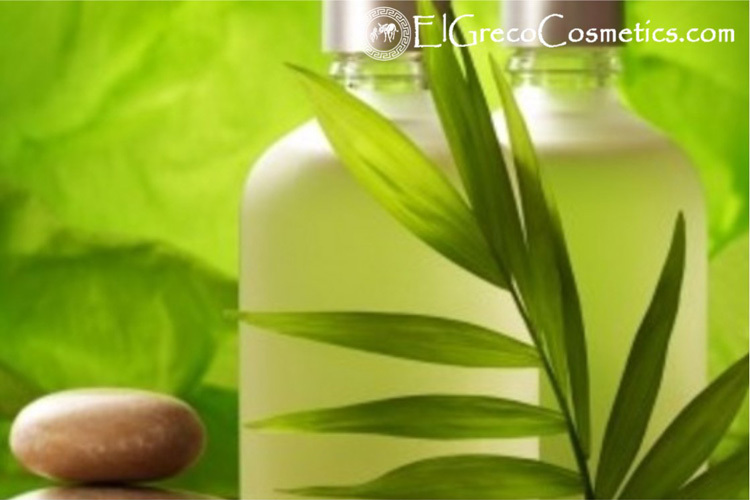 Natural soaps, in general, are the end product of a natural chemical reaction between oils (acids) and lye (a base). They are made from fats and oils that react with lye (sodium hydroxide). Solid fats like coconut oil, palm oil, olive oil castor oil are used to form bars of soap that stay hard and resist dissolving in the water left in the soap dish. So is made also our Natural soap with donkey milk. Traditionally Natural soap contains natural ingredients and it is used by indigenous people for burns, wounds, sunburn, muscle aches and as a moisturizing beauty aid for hair and skin. In this category is also Natural soap with donkey milk. Does it have fluffy lather? Is it sensitive? How hard is the bar? How does your skin feel afterward? The oils we choose in our recipe have a huge impact on what your final soap it is like. Accord to Scientists the perfect bar of natural soap must have the following factors: hardness, cleansing, lather, and conditioning. 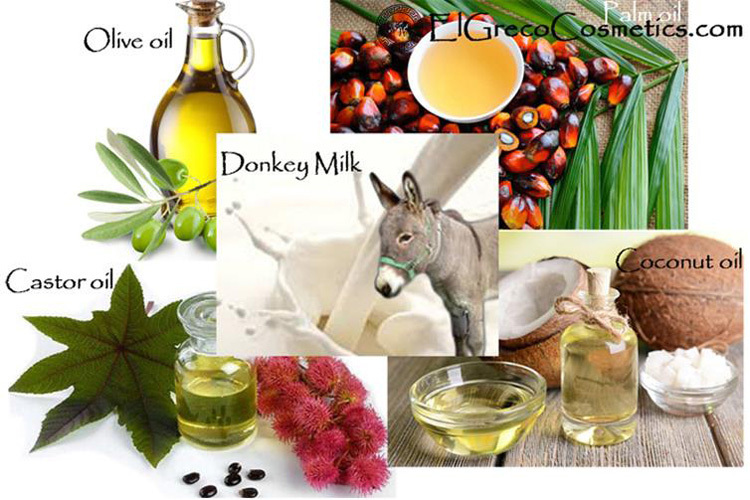 The types of vegetable oils that we are using for making our Natural soap with donkey milk contribute to those factors including hardness, cleansing, lather, and conditioning. Every bar of our Natural soap with donkey milk has a good balance of all of them. What ingredients are in our Natural soap with donkey milk? As a key ingredient for our Natural soap with donkey milk, we are using donkey milk from the donkeys of our farm. What can we say about the properties of donkey milk? Cleopatra the Egyptian queen has said all when she was carrying with her 700 donkeys to take her daily bath in donkey milk for maintaining her beauty! Donkey milk has all!!! Donkey milk The effectiveness of donkey milk components like proteins, minerals, vitamins, essential fatty acids, bioactive enzyme, and coenzyme, allow the skin a balanced nourishment and a proper hydration. Donkey milk contains lactoferrin and a considerable amount of lysozyme. For this reason, donkey milk has the potentiality, when properly formulated, to reduce problem skin with eczema, acne, psoriasis and herpes and properties in calming the irritation symptoms as reported by some authors. That’s why we are very proud of our natural soap with donkey milk! The vegetable oils for making our Natural soap with donkey milk are Coconut Oil, Olive Oil, Castor Oil, palm oil. Hard bar of natural soap with donkey milk. For making our Natural soap with donkey milk hard, which last more than softer soaps, we are using Coconut oil and Palm oil. Coconut oil and palm oil create a hard soap. We are using also Coconut oil for making our Natural soap with donkey milk for perfect cleansing. Fluffy Lather castor oil and coconut oil. For giving to our natural soap with donkey milk the property of conditioning we are using olive oil and castor oil. Why should I use Natural soap with donkey milk? Natural soap with donkey milk contains ingredients that are not, and have not been produced with, herbicides, chemical fertilizers, or pesticides. … Non-natural soaps usually do not contain glycerin (a moisturizing agent). Unfortunately, many people wait until itchy, dry skin is a problem before making the switch to natural soap. 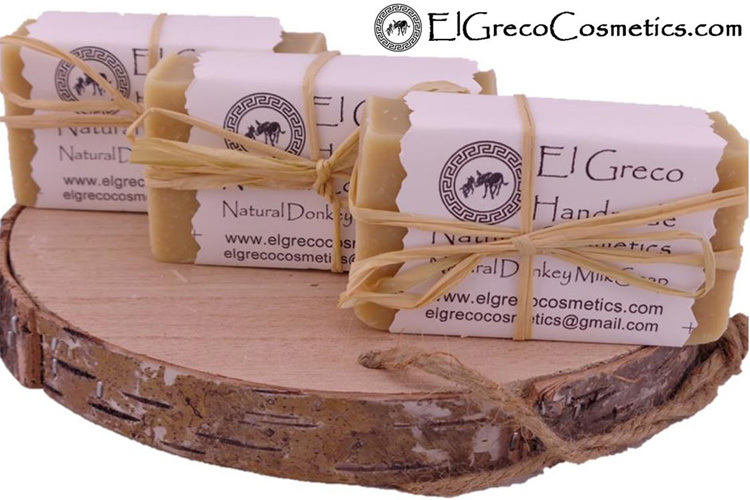 What are the main benefits of using natural soap with Donkey milk? 1. Ingredients of Natural soap with donkey milk. The very best reason to use natural soap with donkey milk is the ingredients. Natural soap with donkey milk is made of vegetable oils that are rich in antioxidants, vitamins, and nutrients that are essential to healthy skin. 2. Natural soap with donkey milk is a real soap. The mass-produced commercial stuff that you get at the grocery store is anything but. You have an array of personal cleansers to choose from that are labeled as deodorant soap, body bars, body washes and my personal favorite (eyes roll) the beauty bar. These are just chemical cocktails made of detergents and downright disturbing synthetic ingredients that dehydrate and age skin, cause allergic reactions and have been linked to various forms of cancer. Natural soap with donkey milk is the real deal and one of the most appealing aspects is that harmful and unnecessary ingredients are NOT added to make it. Differences between natural and commercial you can read an other article of us here. Glycerin isn’t added to a Natural soap with donkey milk recipe – it’s created during the soap making process! Glycerin is a precious emollient that softens and maintains water balance by attracting moisture to your skin. It is proven to be so beneficial to your skin that it is extracted from commercial ‘soap’ and reserved for higher priced body care, hygiene and pharmaceutical products. Natural soap with donkey milk retains all of its natural glycerin glory and produces a rich and luxurious lather that is unparalleled to any other. Variety of Natural soap with donkey milk. If you feel that variety is the spice of life then Natural soap with donkey milk won’t disappoint! No matter your skin type or personal preferences, there is a soap-maker out there who is creating just what your skin and senses crave at bath time. There is an infinite number of recipes and flavors for you to choose from. Have fun shopping around or to chat it up with a soap-maker next time you visit your local craft fair or farmers market. We are dedicated to helping you discover the joy of happy and healthy skin just the way you like it! 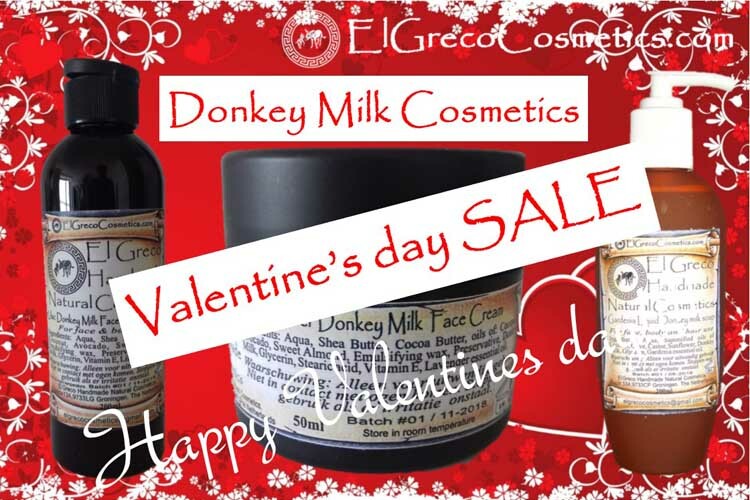 Why El Greco Cosmetics natural soap with Donkey milk?